John Ottway is a sharpshooter responsible for protecting an oil drilling team in a remote part of Alaska from wild wolves. After completing the task, Liam and his colleagues’ board a plane for home, but weather conditions cause it to crash-land in the cold Alaskan wilderness. It’s up to Ottway to lead these headstrong tough guys to safety, before various forces of nature challenge their very existence. The Grey starts out with lofty ambitions. First we’re introduced to a rugged group of guys and they’re not stock personalities. Then there’s a spectacularly horrific plane disaster that all but guarantees that The Grey will never be any airline’s in-flight movie. Given the dire situation, it’s nice to see conversations that legitimately display the kind of dialogue real people facing death would have. That The Grey actually bothers to focus on character development is the story’s nicest surprise. Liam Neeson worked with director Joe Carnahan before on The A-Team and the results then were less than spectacular. 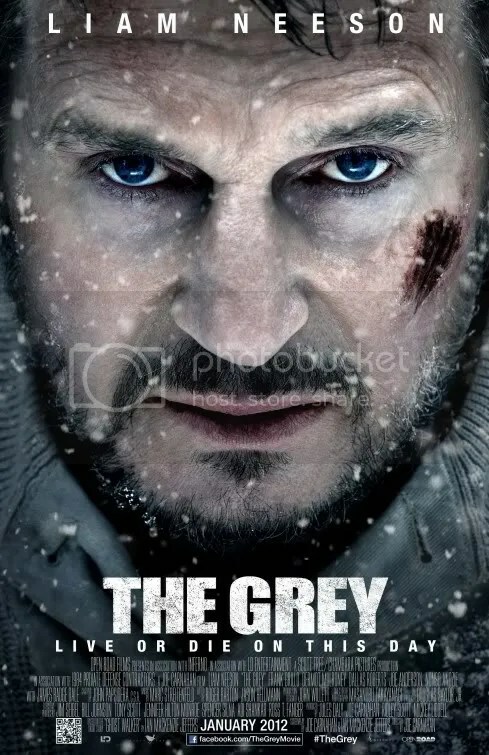 The Grey has a more thoughtful bent than minor films of this ilk. There’s an unexpected amount of personal relationship building in the beginning that an inferior script wouldn’t have even bothered to address. These men have families back home and the movie reinforces sentiment – sometimes awkwardly – whenever they pull out pictures of their families and wave them around. But the fact that the writing attempts something slightly more than a mere slaughter fest is admirable. Unfortunately, despite pretensions to the contrary, this is just an action-adventure at heart. The men must compete with harsh elements initially but their very survival is much more threatened by a pack of gray wolves. The creatures are a combination of CGI, giant puppet animatronics and trained live animals. But just hold on a minute. These aren’t your typical wolves. These creatures are huge – looming over the men like monsters several times the size of a normal sized wolf. They don’t behave like ordinary animals either – more like psychotic killers. The old adage, “they won’t attack unless provoked” doesn’t apply here. These wolves essentially see them as intruders and hunt them down. Once the killing starts, death is a foregone conclusion and the plot devolves into routine. The wolves terrorize and kill, then they retreat to take a break only to ambush them again, over and over without fail. Why they stop each time, instead of just finishing the job, is probably because the filmmakers wanted a longer running time. Given the naturalistic setting and the team’s lack of technological weaponry, I would have preferred a more reasonable animal that might have afforded the men a fighting chance. But these beasts have such an incredible advantage, the storyline becomes predictable, and the outcome is inevitable. The Grey isn’t a bad picture, but it isn’t a great one either. There’s really nothing in it that pushes this past an entertaining diversion of the man vs. nature variety. We have an aircraft that bites the dust in a desolate area with a gang of oilmen aboard. It’s up to the survivors to maintain order and survive in grueling conditions of nature. A film should be judged on its own merits but comparisons here are unavoidable. I kept thinking of other movies while watching this: Deliverance, Never Cry Wolf, The Edge, Into the Wild. 1965’s The Flight of the Phoenix with James Stewart had the same basic setup. But where that classic took the narrative in a wholly original direction, The Grey is content to depict a tale that is decidedly less inventive. Any production that recalls earlier efforts, should strive to be better. Where The Grey succeeds, is the care it takes to develop realistic people. It’s barely an action film. Call it a character study. It exhibits remarkable humanity. At one point faithful John curses God out of frustration. His “Oh why God, why? !” moment is kind of a novelty in an adventure of this sort. These days, I suppose any flick that tries to balance drama with action is something of a anomaly. I’ll give The Grey points for that….oh and a plane crash that will make me think twice the next time I board a plane. This entry was posted on January 27, 2012 at 8:00 pm and is filed under Action, Adventure, Drama, Thriller with tags 2012. You can follow any responses to this entry through the RSS 2.0 feed. You can leave a response, or trackback from your own site. You’ve put appropriate wording behind your mild appreciation for the film, but I still disagree with your tone (basically a futile argument), as I really got into this film and the way it decided to balance a number of different layers, as opposed to being a movie about Liam Neeson fist-punching wolves. As always, I enjoyed your well written review very much. I actually read it before I saw the film and you raised my hopes considerably. The trailer definitely promised a certain kind of film and I was happy to see the actual film raised the bar, at least in the beginning. After I saw the film I was a bit nonplussed by your near-perfect rating. Although we both recommended it, I had a much different experience. I actually wrote my review with yours in mind, so it’s so appropriate that you were the first to comment. I appreciated that. I feel kind of bad that you were able to appreciate the film enough, but not fully embrace it as I was, which I think might have been some of my doing, given the high praise I gave it early on. I of course respect your opinion, it’s just that the tone of your review actually seems kind of angry, which prompted me to respond. I’ll say that I very much avoided expressing my thoughts to Abe, before he saw it, so you can hear his reaction in the podcast, when that gets released. Also, I’m just glad you managed to miss One For The Money. I really like reading your reviews, they area always fun to read. Most likely I read the star rating to see if it a good picture (or film) or not! As everyone is entitled to have an opinion, I love your star ratings and reviews to The Hunger Games, The Avengers, and too Men In Black 3. I hope you post more reviews more often, and always I will really reading them (even though if we disagree on a particular movie). You are also a very nice gentleman who puts extreme thought into his move reviews. I hope read more movie reviews later on in the future. Brian, I prefer star ratings to letter grades. They remind me of school and movies aren’t school for me. But anyway my gut tells me I’d probably give The Avengers and Men in Black 3 an A- and Dark Shadows a C-. Still have yet to see We Bought a Zoo. Thank you for the thoughtful comments. Glad to have you as a reader. hi mark, was just curious, which movie did you like more? : this or The Edge? I’d have to say The Grey was more exciting. Liam has been doing a lot of movies I like. They’re not complicated movies, but they’re all entertaining. This one kept me on the edge of my seat. I liked the actors as “real” people, not ” super human” , heroes. I think I’m the only person who didn’t like this film! I was bored, fighting to stay awake, and I don’t like production details behind it. I’ve also lost more respect for Neeson, whom I have a volatile relationship with at the best of times, after he has publicly admitted to eating wolves. I just saw this. Not sure what I’ll write about it quite yet. I’ll probably give it an A- (four stars).